We are always here when you need us. Committed to meeting the needs of businesses and individuals, we pride ourselves on becoming the highest quality printing company in Columbia, South Carolina. Whether you want your next brochure professionally designed by one of our in-house graphic artists or a direct mail piece personalized with variable data printing, we'll exceed your expectations with our high quality service, knowledge and the printing experience you deserve. We help our clients produce award winning print products. To see the many ways we can help you with your print project, check out the services we offer, including advertising specialty products. 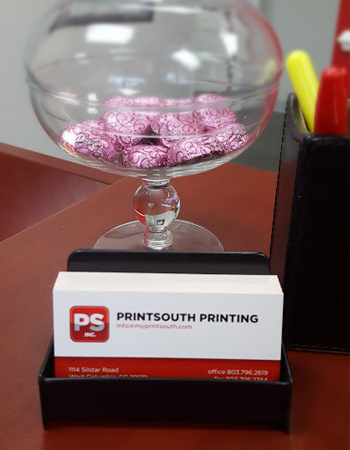 For over 25 years, PrintSouth Printing has been providing excellent printing and bindery service to the Columbia, South Carolina area. Our employees are experts in their fields and are here to help you achieve the best look for your project.